Camp Bloodbath is pretty much what it sounds like. The early 1980s slasher film has a loyal cult following, but nobody would what to become a part of it. After all, there will only be one young scantily clad woman who survives the massacre. Sadly, it is not the character played by Max Cartwright’s actress mother. That makes it even more disconcerting for her when she and her high school associates are swept into the vintage exploitation movie. Not even the Scream franchise was as satirically meta and self-referential as Todd Strauss-Schulson’s The Final Girls (trailer here), which opens this Friday in New York. Max and her mother Amanda Cartwright were always scuffling, but at least they had each other—until the fatal accident. Her biggest part was Nancy the camp counselor who unwisely relinquishes her virginity in Camp Bloodbath. Unfortunately, its campy reputation was more of a hindrance than a help whenever Cartwright auditioned for parts. Therefore Max has rather mixed feelings towards the film. Nevertheless, she agrees to attend the anniversary screening organized by her best friend Gertie’s annoyingly Tarantino-esque step-brother Duncan, in exchange for help in the class she is failing. Gratifyingly, Chris, the classmate she is most definitely interested in, comes to offer moral support. Less agreeably, his codependent ex also tags along to gum up the works as best she can. Somehow, when disaster strikes they are all supernaturally transported into the world of Camp Bloodbath. Of course, it takes a while to figure out where they are and what are the rules that apply to them. Fortunately, Duncan knows precisely when and where bullied camper turned savage serial killer Billy Murphy will strike. 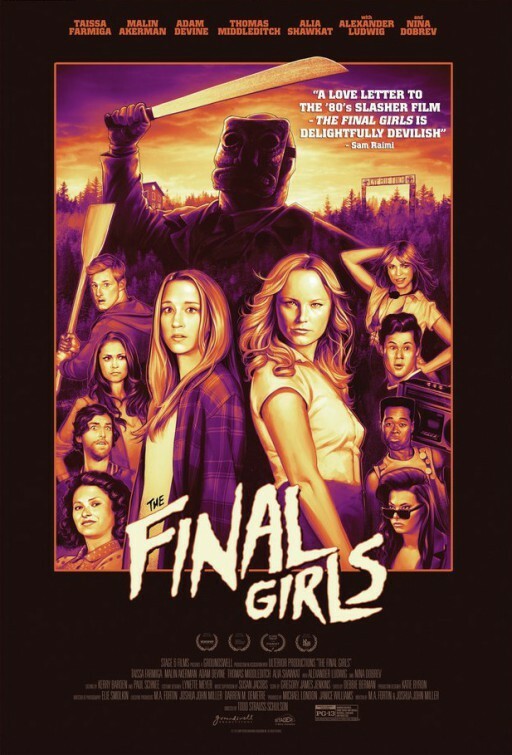 They assume if they stick close to surviving “final girl” they should be fine. However, that will not be Nancy, whom Cartwright cannot help relating to as her mother. Without a doubt, Final Girls is the best horror send-up since the original Craven-era Scream films. While there are a decent number of laughs, it is more about visual inventiveness than set-ups and punchlines. The world of Camp Bloodbath is actually a closed ecosystem that strictly follows its own rigid logic. Frankly, it all makes perfect sense if you are a horror movie fan. Final Girls also features an unusually big named cast for a horror spoof-nostalgia trip. Honest to goodness, Malin Åkerman is shockingly sweet and poignant as Amanda Cartwright and the character of Nancy as played by her. She also has some really nicely turned scenes with Taissa Farmiga, who makes a worthy prospective “final girl” as Max. As Gertie, Alia Shawkut is sort of doing her Arrested Development shtick again, but it works pretty well in the film’s context. However, Angela Trimbur and Tory N. Thompson steal scene after scene as Tina the nymphomaniac counselor and Blake the ultra-New Wave counselor. It will probably be a cold day in the netherworld before production designer Katie Byron, art director Alexi Gomez and the rest of the design team get the awards recognition they deserve for Final Girls, but they make the film look terrific, in an eccentrically macabre way. Movie fans with any love for eighties horror will find it seriously stoked by M.A. Fortin & Joshua John Miller’s thoroughly clever screenplay and Strauss-Schulson’s high energy level. However, viewers should be cautioned to look for that plural “s.” The recently released Final Girl singular is an entirely different film. Highly recommended for retro genre connoisseurs, The Final Girls opens this Friday (10/9) in New York, at the AMC Empire.